With the crankshaft installed and the main bearings snugged down, I tried to turn the crankshaft by hand. It should have felt tight and smooth and firm, but it was, like the curate’s egg, only good in parts. There were tight spots, and even when the mains were loosened, there were tight spots. 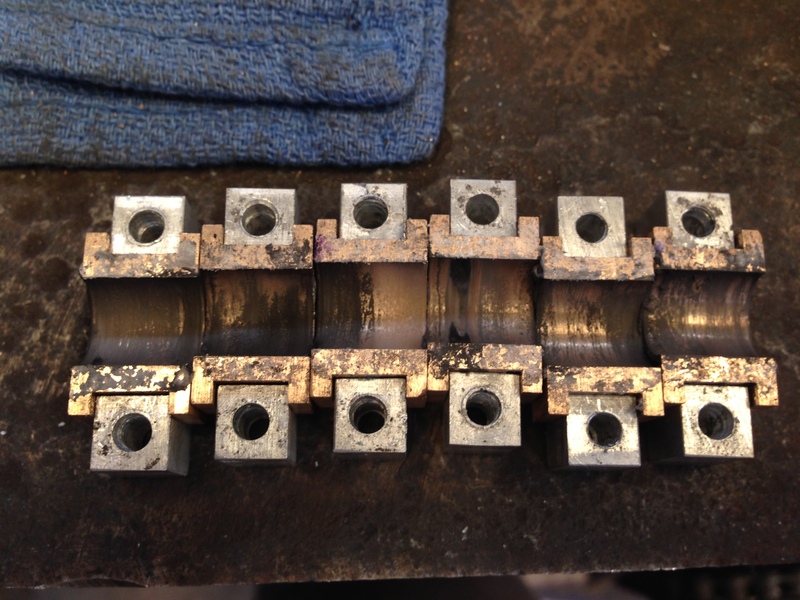 So I tried turning the crankshaft by hand some more, thinking that the high spots would wear down. But with only minimal improvement. Clearly some more aggressive lapping would be required. I have some diamond lapping paste, in various grades, and I have no doubt that it would have been effective at taking off the high spots. The problem is that the diamond dust can impregnate the softer metal in the bearing ie. the gunmetal, and remain there, continuing to score and wear the bearings for ever. 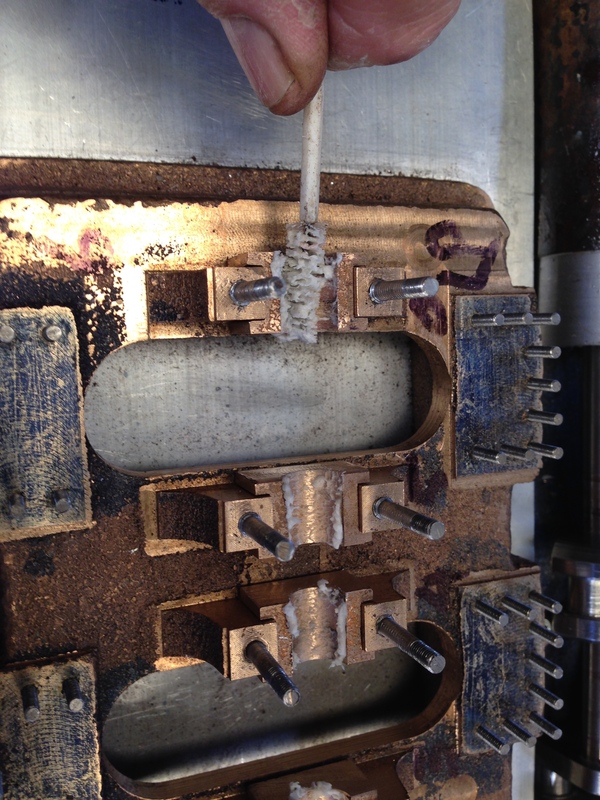 A colleague suggested using a grinding paste containing a much softer grinding material. Toothpaste was mentioned, along with some kitchen scouring cleaners. I could not find any such things in my workshop, so off to the supermarket I went. SWMBO claims that I have no idea about supermarket shopping, and on this occasion, she was correct. Confronted by dozens if not hundreds of cleaning agents, I was totally bewildered by the array of options. So I did what any self respecting red blooded Aussie male would do… I rang her and asked which brand to buy. 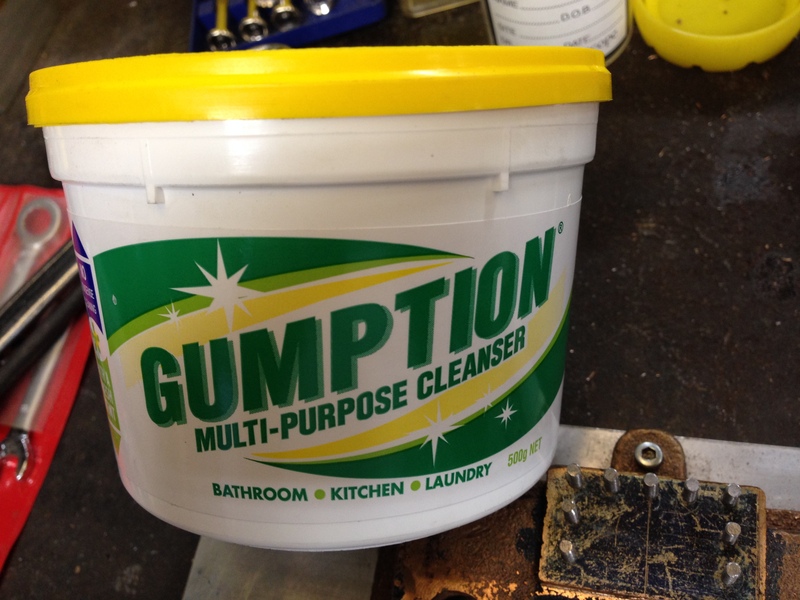 This is what I bought…..
Gumption bathroom kitchen laundry cleaner. Using a small brush which any gynaecologist will recognise..
And set up the crasnkshaft – base – bearings in the lathe …..
And ran the lathe at 40 rpm for a few minutes. The temporary nature of the abrasive in the cleaner was evident by the scratching noise which stopped after a few revolutions. 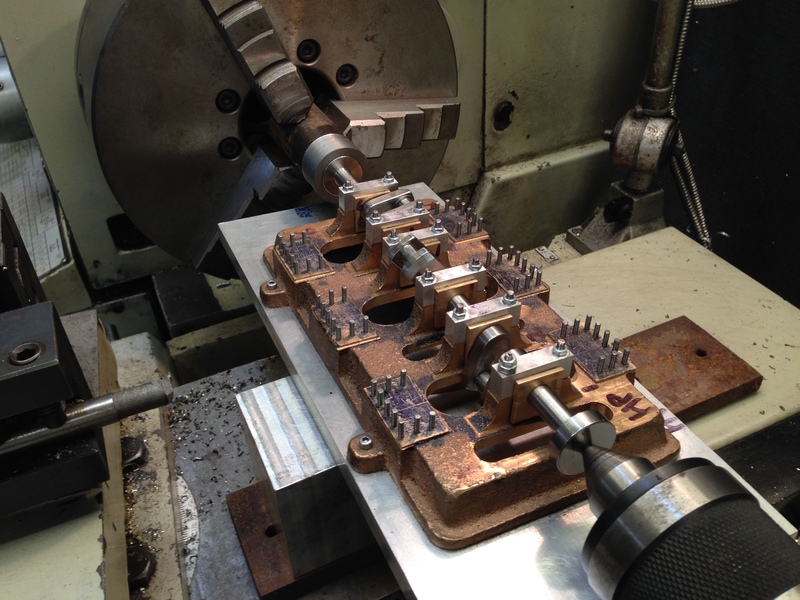 The 5hp lathe motor was required to overcome the friction caused by the paste. Very quickly, the resistance to turning disappeared, and it was obvious that the Gumption was working. (later, when I used the same method on the big end bearings, I found that it was quicker and easier to turn the motor by hand. Huge force was not necessary. And it took only 5-10 revolutions to do the job). After grinding with Gumption, the bearings were disassembled so the paste could be cleaned off. The high spots which were removed were quite visible. 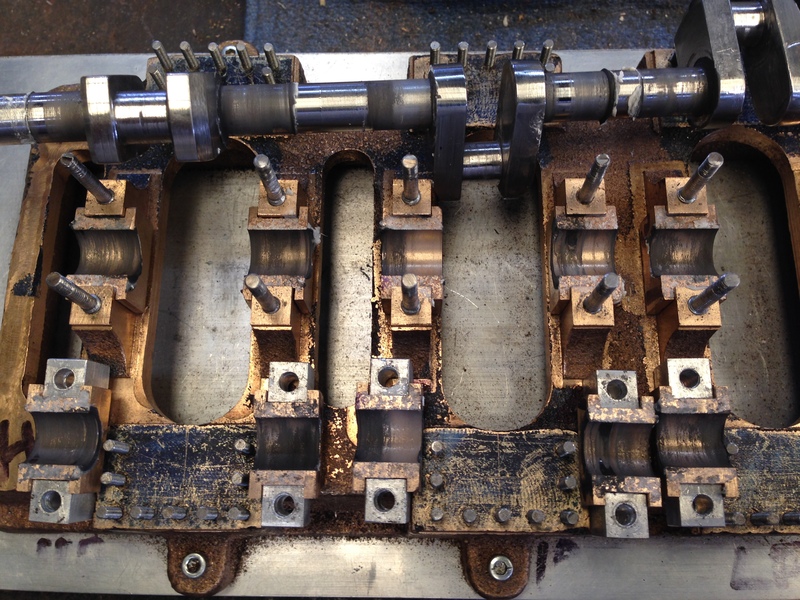 After cleaning off the remains of the paste, and assembling the crankshaft, I retested the crankshaft & bearings. An amazing difference! Now it was smooth, and I was able to turn the shaft by hand, even with the bearing nuts tightened quite substantially. I might repeat the process to improve things even more. Very impressed with Gumption. Great stuff. Did you check the bearing surfaces on the crankshaft were concentric before you attempted to fit it in the bearings?